Deeply hydrate, firm and tone the delicate skin around your eyes while reducing the look of fine lines and crow's feet with our most popular, fragrance-free eye cream. Hyaluronic Acid (HA), also known as nature's moisture magnet, has the ability to hold up to 1,000 times its weight in water, binding moisture to help soften, smooth, tone and rehydrate skin. 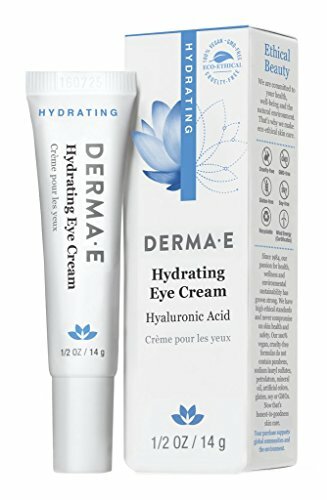 Only DERMA E has blended the unmatched hydrating properties of HA with antioxidants Pycnogenol and Green Tea, moisturizing Jojoba Oil and nourishing Vitamins A, C and E into a rich, replenishing eye cream to keep eyes young and radiant looking. 100% vegan, cruelty-free, paraben-free, sulfate-free, mineral oil-free, lanolin-free, gluten free, GMO-free. Please note that DERMA E is in a packaging transition. There is a chance your products will arrive in the older package instead of new, please know that we assure you it is the same great formula with effective results. Previously known as Hyaluronic & Pycnogenol Eye Creme.